For every personality, there's a Jeep. Which is yours? Every star deserves good lighting. With its main projector beam headlamps illuminating its entrance and an LED lighting strip for that extra flair, the Jeep Compass Limited is always dressed to impress. Bright chrome molding and a gloss-black two-tone roof provide an air of sophistication rarely seen in '18 - and the luxury continues when you go inside. The Uconnect 4C's impressive 8.4-inch touchscreen serves as your personal navigator and DJ thanks to the integrated Android Auto & Apple Car Play, giving you access to your favorite songs at your well-groomed fingertips. Driving solo for a grocery run? The rear cargo area lets you configure your interior for more space when needed with 60/40 rear seats that fold flat so you can replace passengers for a lifetime's supply of groceries. For maximized space, the front passenger seat also folds down, meaning you'll be the first person your friends call when they need help transporting furniture. Why be restricted to driving in the street? Pave your own road in the Jeep Compass Trailhawk while enjoying best-in-class 4x4 capability as well as best-in-class 4x4 highway fuel economy. Fuel-saving stop/start technology shuts the engine off when the vehicle stops, then starts the engine again when the brakes are released, decreasing the number of times you're filling up at the gas station. Plus, why avoid obstacles on your road or in your life when you can just cruise right over them? Increased ground clearance gives you an impressive 8.5 inches off the ground to protect your undercarriage. Still, no matter what the road looks like, the Selec-Terrain Traction Management System and the Jeep Active Low 4x4 System will be your copilots, optimizing your driving experience for whatever's in your path- snow, sand, mud or rock. Go mudding through the hills worry-free with Hill Descent Control which monitors throttle, speed and braking on steep slopes allowing the driver to simply concentrate on the steering while your Trailhawk does the work. It even has Hill Start Assist, which keeps your brakes applied after you've released the brake pedal to give you time to accelerate without rollback. As if the Trailhawk wasn't fun enough, it's got a towing capacity of 2,000 pounds, allowing you to add jet skis, dune buggies or other toys to your adventure. you also conveniently control your phone and audio via the sound of your voice. Enjoy your surroundings with your Dual-Pane Sunroof serving as your sliding glass ceiling, keeping you cool during the day while allowing you to watch the stars from the safety of your Jeep. And with 70 available safety and security features, including the ParkView Rear Back Up Camera, the Jeep Compass Latitude is a vehicle you can trust. Who says you can't be safe and stylish? 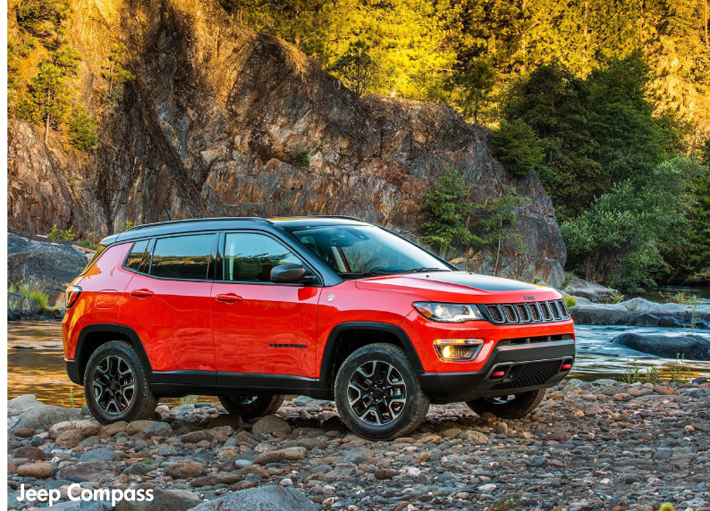 If you love all the benefits of driving a Jeep but also feel that need for speed, the Jeep Compass Sport was designed for thrill seekers like you! Boasting a 2.4-liter Tigershark MultiAir 2 engine, this is a jeep with a bite! Throw in the available Tech Package and you'll enjoy unparalleled comfort and entertainment whenever you're behind the wheel. Included is the much-coveted Uconnect 4 with a 7-inch touchscreen, 7-inch Information Digital Cluster Display, Dual-Zone Automatic Temperature Control, humidity sensor, premium air filter, 115-volt inverter and a 12-month subscription to SiriusXM Satellite Radio.